The paper addresses the issue of identifying a technical state of rotating parts with the use of vibrodiagnostics. This method has been developing rapidly for recent years and is assumed to be used for predicting failure occurrence. In this paper we focus on monitoring a technical state of a medium truck bearing box where we simulate different field conditions and their dependence on the RMS – root mean square. A measuring device DEWE 50/8 including the DEWEsoft software product of the Dewetron company have been used for the actual measurement. The aim of the work is to calculate the values of root mean square acceleration up to the moment a failure occurs. In the next step we will put the values into a graph and try to determine a gRMS limiting value. In the future this enables us to change the bearing before a failure occurs otherwise it would increase the related cost. Aluminum matrix composites composed of Al, Al-5,6 wt.% Cu (Al5.6Cu), Al-7 wt.% of alpha brass α-Cu0,8Zn0,2 (Al7CuZn) and Al-9 wt.% of nickel brass Cu0,64Zn0,31Ni0,05 (Al9CuZnNi) as the matrix and 15 vol.% of TiC and synthesized Al-Ti-C master alloy (MA) as the reinforcement were successfully fabricated by hot forging. Sliding wear tests were conducted at different velocity and loads using a pin- on-disc apparatus and under dry conditions. The results of the investigations indicate that the coefficient of friction significantly lower in composites with Al-Ti-C master alloy then that reinforced with TiC, while the wear rates are lower in composites with Cu additions. The post-test analysis of the material damage mechanisms were examined by optical profilometer. Now there are a number of important scientific and technical problems of producing fibers with a specified set of properties and high quality indicators, process optimization and efficient processing of their applications. In this context, the aim of this work was the possibility of creating new self-reinforced polymer composites based on ased on aromatic polyamide phenylone reinforced with organic fibers.The properties of self-reinforced composites based on aromatic phenylone are presented. It is shown that the optimum fiber content are 5-10 wt.% in the polymer matrix. The waste powder produced during the manufacture of marble, which is presently mostly discarded in landfills, has the potential for higher-valued usage. Recycling marble waste powder will contribute to the protection of nature as well as economic gain. The goal of this study is to investigate the potential use of marble waste powder as filler in the thermoplastic composites with wood. Thermoplastic composites were manufactured by adding marble factory waste powder and wood powder in different ratios to polypropylene (PP). Maleic anhydride grafted polypropylene (MAPP) were used as coupling agent to improve interfacial adhesion between hydrophilic wood–fibers and hydrophobic polypropylene. The waste marble powder and wood powder were mixed by weight of with polypropylene in the percentage of 0%, 10%, 20%, 30%, 40%, and 50%. Physical and mechanical tests were performed on the specimens prepared from the thermoplastic composites. Although mechanical properties of the composites decreased with increasing content of the marble powder, the water absorption of the composites significantly decreased with increasing content of the marble powder. The paper justifies the importance of the experimental determination of rotational variability of cardan drives and couplings. The objective of the authors’ team was to elaborate a new automated test machine for the determination of this variability. The principle design of this new automated test machine is described in details. The advantages of the application of electronic measuring equipment in combination with PC for the automation of the measuring and experimental data processing are pointed out. The test machine gives opportunities for changing of the angles between the driving and the driven shaft and for regulating the rotational speed of the driving shaft. 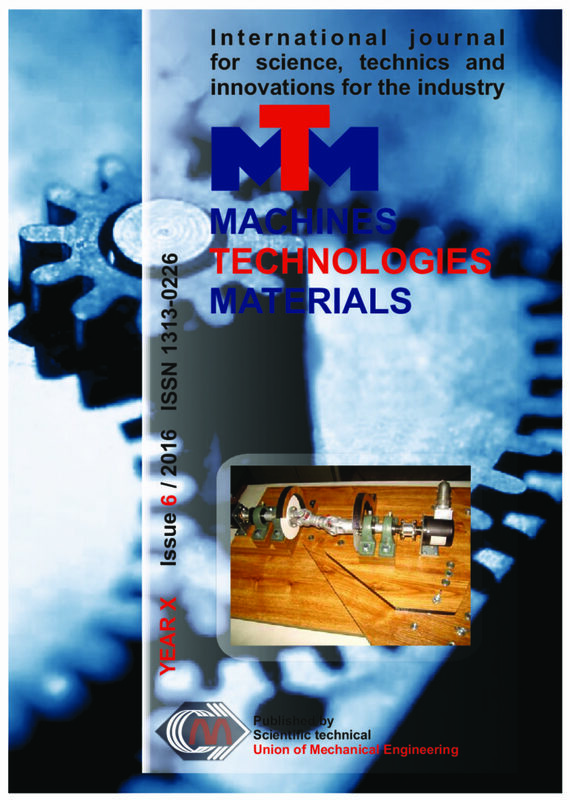 The other functions of the electromechanical test machine are described in details in the paper. Conclusions are made: the methodology for experimental research of rotational variability of cardan drives is improved; the application of electronic test machine verifies the advantages of the usage of high sensitive and precise sensors of new generation; contemporary approaches are applied. The paper presents the characteristics of a modern software system for modeling and optimization of technological processes MOTP_VTU. It outlines the possibilities also to use the system at the design stage. A comparative analysis is performed of three characteristics to apply the new software system MOTP_VTU related to a similar existing one – DSAT-16. via similar systems it is possible to expand the basis of constructions and of functional materials in low technological level during exploration of the set of properties of these materials. This process of realization of scientific and technical ideas is a process to search via multi criteria support of decision making between the project task and the actual possibility, determined by the chemical composition and the processing-mode parameters. Zing galvanized panels were ordered and delivered for the fencing of the factory yard. But immediately after receiving the panel from the deliverer, it was concluded that their quality is suspicious. These panels must fulfil strict standards requirement concerning their quality. To confirm this purchaser engaged the team from the Faculty of Technology ad Metallurgy in Skopje to perform investigation and to check if the panels satisfy quality requirement. The performed investigation consists of the following testing’s: chemical composition of base metal (wire), wire diameter and tolerances, tensile test, weld shear strength test, mesh size and tolerances, coating, visual inspection of panels. Performed investigation confirmed that delivered panels didn’t fulfill necessary requirement for this type of fencing. This study was initiated to compare the wear and corrosion performances of an AA7075 quality aluminum alloy after electroless Ni-P process. The characterization of the coating was made by microscopic examinations, thickness, surface roughness and hardness measurements. Wear and corrosion performances of the uncoated and coated samples were investigated by using a reciprocating wear tester and a Potentiodynamic Polarization Scanning (PDS) technique, respectively. Formation of Ni–P layer on AA7075 aluminum alloy accompanied not only by remarkable increase in the surface hardness, but also caused significant improvement in wear and corrosion resistances. In this study, graphene oxide (GO) was synthesized from graphite by using the Hummer method. GO was reduced using hydrazine hydrate to achieve reduced graphene oxide (RGO). GO and RGO powders synthesized by these methods can be used as fillers in the production of polymer matrix composite. These synthesized powders was examined in detail using the Zeta Potential (ZP) measurements, Ultraviolet Visible Spectrophotometer (UV-VIS), X-Ray Diffraction (XRD), Scanning Electron Microscopy (SEM) equipped with Energy Dispersive Spectroscopy (EDS) analyzer and Thermogravimetric-Differential Thermal Analysis (TG-DTA). All analysis results confirmed the GO and RGO considered as fillers in the production of polymer matrix composite can be prepared successfully. The article is devoted to the calculation and verification of the shredding chamber of a two-shaft shredder for crushing of concrete, rubber, plastic and wood. In this work a model study of the shredding chamber of such type of shredder has been done. The studies of the mechanical load and behavior of the shredding chamber have been conducted through solving the equations describing the mechanical processes under operating conditions by the finite element method. For this purpose, a three-dimensional geometric model of the bottom of the chamber has been generated, which is discretized to a planned network of finite elements in the programming environment of ANSYS MECHANICAL APDL. An alternative method for kinematic and power analysis of compound gear train is presented, which uses the torques and lever analogy of a given gear train. The method combines the accuracy of the Willis analytical method with the clarity of the graphic method of Kutzbach. Unlike these methods, the torque method allows determining not only the gear ratio, but the magnitude and direction of power flows, and hence the determination of efficiency of a given compound planetary gear train. The application of the method is illustrated with example of complex change-gear (gear-box). Combustion synthesis was applied as a novel approach to produce carbon-related nanostructures. Redox reactions in the systems Mg/Si/GO/SiFx yielded interesting products like silicon carbide nanowires (SiCNWs) and graphene-related nanostructures. The results of experimental studies of the influence of electron beam parameters (density of heat action, the speed of movement) on the properties of the surface layers of the elements of optical ceramics (changes in the structure of the material through the thickness of the element, the amount of surface microhardness, values of residual thermal stresses in the layers, the thickness of the hardened layers, their stability to external thermal and mechanical stresses) are. The optimum range of parameters of the beam, within which there is improvement in the properties of the surface layers of the optical elements, which leads to the increase of the basic technical-operational characteristics of devices based on (reliability, lifetime) in the conditions of use of devices with the influence of external-heat are established. In this study we consider functionally graded magneto-electro-elastic materials (MEEM) subjected to anti-plane time-harmonic load. The purpose is to evaluate the dependence of the stress concentration near the crack tips on the frequency of the applied external load. The mathematical model is described by a boundary value problem for a system of partial differential equations. Due to the existence of fundamental solutions the boundary value problem is reduced to a system of integro-differential equations along the crack. The fundamental solutions are derived in a closed form by the Radon transform. For the numerical solution software code in FORTRAN 77 is created and validated. Simulations show the dependence of the stress intensity factors (SIF) on frequency of the incident wave for different types of load, configurations of cracks and different parameters of inhomogeneity. This investigation was performed on the request of the Company for production of the solar systems collectors. Subject of the investigation is the segment of the solar stainless steel collector for the heating water in the swimming pool. The system was installed in the private property and was in use until August 2015 (about one month after installation) when it was disconnected for a period of about one month. After that system was restarted again and it was noticed that many cracks appeared in vertical tubes φ8 mm of collector manufactured of S304 stainless steel. In the horizontal pipes made of S316 steel cracks were not detected. This investigation should give the answer what is the reason for appearing of cracks in stainless steel pipes for pretty short period of exploitation.